Championship points: 1 Byrne and Crutchlow 45pts, 3 Rutter 32, 4 Camier 24, 5 Sykes and J Ellison 18, 7 Easton and M Laverty 17, 9 Haslam 13, 10 J Laverty 9. Privateers cup: 1 J Laverty 50pts, 2 Jessopp 30, 3 Ashley 29. Fastest lap: Kennaugh 1:18.429 – 108.14mph. Championship positions after one of 12 rounds: 1 Brogan 25pts, 2 Richards 20, 3 Martin 16, 4 Kennaugh 13, 5 Lowry 11, 6 Grant 10, 7 Nutt 9, 8 Hutchinson 8, 9 Young 7, 10 Neate 6. KTM Super Duke Battle: 1 A Fagan 16:54.141 – 199.35mph, 2 d wood, 3 J Edmeades, 4 D Heal, 5 A Gault, 6 K Reilly, 7 J Pearson, 8 P Lane, 9 R Lowe, 10 P Hasler. Championship points: 1 Wood 25pts, 2 Edmeades 20, 3 Heal 16. Yamaha R1 cup: 1 J Kirkham 18:27.640 – 107.20mph, 2 S Emmett, 3 M Nutt, 4 G Mason, 5 A Coates, 6 S Warren, 7 J Kennedy, 8 J Cox, 9 S Etheridge, 10 P Bevan. Championship points: 1 Kirkham 25, 2 Emmett 20, 3 Nutt 16. Superstock 1000 championship: 1 S Brogan (Hon) 20:35.729 – 102.95mph, 2 J Kirkham (Yam), 3 C Donald (Suz), 4 M Neill (Suz), 5 P Hickman (Yam), 6 C Cummins (Yam), 7 A Seeley (Yam), 8 G Johnson (Hon), 9 H Mainwaring (Suz), 10 V Cox (Yam). Championship points: 1 Brogan 25, 2 Kirkhamn 20, 3 Donald 16.
ritish 125 championship: 1 P Jordan 20:16.922, 2 M Wilcox, 3 M Hoyle, 4 J Ford, 5 L Costello, 6 S Finlay, 7 L Hinton, 8 T Hayward, 9 L Mossey, 10 M Glossop (all Hon). Championship points: 1 Jordan 25pts, 2 Wilcox 20, 3 Hoyle 16. Superstock 600 championship: 1 L Jones (Yam) 13:35.751 – 103.97mph, 2 C Northover (yam), 3 J Hamilton (Kaw), 4 J Morris (Suz), 5 D Haire (Yam), 6 J Day (Yam), 7 L Johnston (Yam), 8 R Brown (Yam), 9 A Gault (Kaw), 10 L Stapleford (Kaw). Championship points: 1 Jones 25pts, 2 Northover 20, 3 Hamilton 16. 6 Bolliger Team, Switzerland (Kaw) 14. 12 Diablo 666 Bolliger, (Kaw) 6. First Superbike: 1 M Mladin, Australia (Suz) 40:14.012 – 96.039mph, 2 J DiSalvo, USA (Yam), 3 T Hayden, USA (Suz), 4 J A Hacking, USA (Kaw), 5 N Hodgson, GB (Hon), 5 M DuHamel (Hon). Second: 1 Mladin 40:08.361 – 96.265mph, 2 B Spies, USA (Suz), 3 Hayden, 4 DiSalvo, 5 Hodgson, 6 E Bostrom. Championship points: 1 Mladin 113pts, 2 DiSalvo 88, 3 Hayden 85. British: 5 Hodgson 76. Supersport: 1 J Herrin, USA (Yam) 24:59.013 – 93.902mph, 2 B Bostrom, USA (Yam), 3 J P Zemke, USA (Hon), 4 B R Young, USA (Suz), 5 S Rapp, USA (Kaw), 6 M Cardenas, USA (Suz). British: 10 C Davies (Kaw). Championship points: 1 Bostrom 71pts, 2 Herrin 69, 3 Young 53. British: 7 Davies 48. Formula Xtreme: 1 J P Zemke, USA (Hon) 23:27.922 – 94.096mph, 2 Cardenas, 3 Davies, 3 L Pegram, USA (Duc), 5 S Rapp, USA (Kaw), 6 A Gobert (Hon). Championship points: 1 Davies 65pts, 2 Cardenas 59, 3 Rapp 58. There was double delight for both Gareth Keys and Brian Patterson during Saturday’s second round of the Irish clubmans short circuit championship at Bishopscourt, Co Down. Keys unlocked his first 600 successes with split second wins over Phillip Erwin while Patterson had to work equally hard for his superbike wins. After cutting his racing teeth in the 125 ranks, Keys graduated to the supersport class where he was on board a rather special Yamaha. “This is a five year old bike and it was previously raced by Jason Griffiths, Dwyer Agnew and William Dunlop” explained 17 year old Keys who comes from Lisburn. 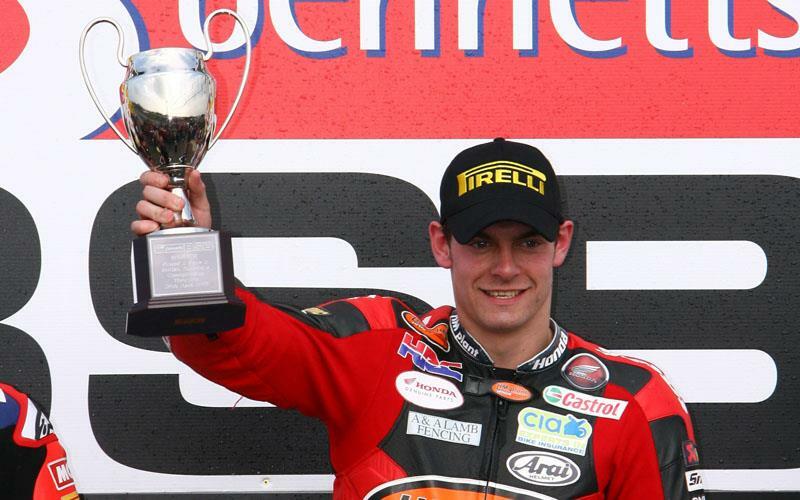 First 125 Aprilia (7 laps – 12.6 miles): 1 A Reid 10:43.95 – 71.37mph, 2 D Cassells, 3 J Loughlin. FL: Reid 1:28.86 – 73.89mph. Second (6 laps – 10.8 miles): 1 Cassells 9:11.22 – 71.47mph, 2 Reid, 3 Loughlin. FL: Cassells 1:28.64 – 74.07mph. First 125GP (7 laps): 1 R English 9:48.18 – 78.14mph, 2 R Glasgow, 3 S Wilson (all Hon). FL: Glasgow 1:21.36 – 80.70mph. Second (6 laps): 1 Glasgow 8:18.45 – 79.04mph, 2 English, 3 W Morrell (Hon). FL: Glasgow 1:20.87 – 81.19mph. First pre-97: 1 S Thompson 10:49.14 – 80.92mph, 2 R Taylor, 3 S Meally (all Hon). FL: S Smith (Hon) 1:18.83 – 83.29mph. Second (6 laps): 1 S Smith 8:03.89 – 81.42mph, 2 Thompson, 3 J McCay (Hon). FL: Smith 1:18.44 – 83.71mph. First 600: 1 G Keys (Yam) 10:13.96 – 85.56mph, 2 P Erwin (Hon), 3 K Fitzpatrick (Tri). FL: Erwin 1:14.67 – 87.93mph. Second (7 laps): 1 Keys 8:53.49 – 86.16mph, 2 Erwin, 3 L Morrissey (Yam). FL: Erwin 1:14.96 – 87.59mph. First 1010: 1 B Patterson (Suz) 10:17.63 – 85.05mph, 2 B Smith (Suz), 3 D Morgan (Hon). FL: Smith 1:15.37 – 87.12mph. Second (7 laps): 1 Patterson 9:02.63 – 84.71mph, 2 G Johnston (Yam), 3 Morgan. FL: Patterson 1:15.69 – 86.75mph. First National (6 laps): 1 D Craig 7:25.75 – 88.38mph, 2 A Nicholl, 3 R Clarke (all Suz). FL: Craig 1:12.79 – 90.21mph. Second (6 laps): 1 Nicholl 7:26.95 – 88.15mph, 2 Craig, 3 Clarke. FL: Nicholl 1:12.30 – 90.82mph. First classic (7 laps): 1 J Conroy 10:31.20 – 72.81mph, 2 A McFarland, 3 G Stinson (all Hon). FL: Conroy 1:28.25 – 74.40mph. Second (6 laps): 1 Conroy 8:56.11 – 73.48mph, 2 A Conroy (Hon), 3 McFarland. FL: J Conroy 1:27.43 – 75.11mph. Non-qualifiers (7 laps): 1 S McAleece (Suz) 9:42.92 – 78.85mph, 2 B Byrne (Hon), 3 K English (Yam). FL: McAleece 1:20.37 – 81.69mph. Triumph mounted John Simpson stormed to eight wins from eight starts at the New Era club two dayer at Cadwell Park. Allcomers up to 500 (6 laps): 1 J Newstead 10:41.63 – 73.389mph, 2 D Hatton, 3 T Doughty (all Hon). FL: Newstead 1:45.74 – 74.22mph. All comers 1300 (6 laps): 1 C Matthews (Duc) 10:07.75 – 77.48mph, 2 A Percival (Yam), 3 N Richards (Hon). FL: Percival 1:38.87 – 79.38mph. First 125: 1 B Wood 13:57.24 – 75.99mph, 2 J Lea, 3 E Rendall (all Hon). FL: Rendall 1:42.72 – 76.40mph. Second: 1 Rendall 13:51.36 – 75.52mph, 2 Lea, 3 Wood. FL: Rendall 1:41.84 – 77.06mph. First F400: 1 M Nerlich (Kaw) 14:10.95 – 73.78mph, 2 N Blockley (Hon), 3 Newstead. FL: Nerlich 1:44.28 – 75.26mph. Second: 1 Blockley 10:06.91 – 74.13mph, 2 Nerlich, 3 Newstead. FL: Nerlich 1:44.10 – 75.39mph. First F600 (9 laps): 1 J Simpson (Tri) 14:35.76 – 80.65mph, 2 A Hooper (Yam), 3 D Miles (Hon). FL: Simpson 1:35.58 – 82.11mph. Second (9 laps): 1 Simpson 14:31.59 – 81.04mph, 2 Percival, 3 Hooper. FL: Simpson 1:35.18 – 82.47mph. First supermoto: 1 A Hughes 14:17.06 – 73.26mph, 2 S Goldsmith, 3 W May (all KTM). FL: Hughes 1:45.27 – 74.55mph. Second: 1 Goldsmith 14:15.52 – 73.33mph, 2 Hughes, 3 May. FL: Hughes 1:45.30 – 74.53mph. First sound of thunder (9 laps): 1 Simpson 14:35.39 – 80.69mph, 2 P Noble (Hon), 3 G Smith (Duc). FL: Simpson 1:35.46 – 82.21mph. Second (9 laps): 1 Simpson 14:37.46 – 80.50mph, 2 Noble, 3 Smith. FL: Simpson 1:35.71 – 82mph. First pro bike open (5 laps): 1 P Scott (Suz) 8:05.91 – 80.76mph, 2 J Fisher (Suz), 3 G Shaw (Yam). FL: Scott 1:35.50 – 82.10mph. Second (9 laps): 1 Scott 14:34.68 – 80.75mph, 2 Fisher, 3 Shaw. FL: Scott 1:35.63 – 82.07mph. Allcomers 500 (6 laps): 1 Rendall 12:10.74 – 64.44mph, 2 M Ford (Hon), 3 A Smith (Hon). FL: Newstead 1:52.53 – 69.74mph. Allcomers 1300 (6 laps): 1 Shaw 10:40.71 – 73.49mph, 2 S Rowbottom (Tri), 3 G Bramwell (Suz). FL: Shaw 1:44.32 – 75.23mph. First 125: 1 A Shelton 15:39.33 – 66.64mph, 2 Rendall, 3 B Rudge (all Hon). FL: Shelton 1:54.33 – 68.64mph. Second: 1 Shelton 15:31.57 – 67.40mph, 2 Lea, 3 Rendall. FL: Shelton 1:53.35 – 69.24mph. First F400: 1 Newstead 15:23.03 – 68.02mph, 2 N Blockley, 3 M Liddy (Hon). FL: Blockley 1:52.43 – 69.80mph. Second: 1 Newstead 15:15.08 – 68.61mph, 2 Blockley, 3 F Crouch (Kaw). FL: Newstead 1:52.83 – 69.56mph. First F600: 1 Simpson 14:11.37 – 73.74mph, 2 R Simmonds (Hon), 3 Hooper. FL: Simmonds 1:44.64 – 75mph. Second (7 laps): 1 Simpson 12:09.22 – 75.34mph, 2 Simmonds, 3 Rowbottom. FL: Simpson 1:42.74 – 76.39mph. First supermoto: 1 C Willett 15:23.51 – 67.98mph, 2 Hughes, 3 H Prebble (all KTM). FL: Willett 1:52.14 – 69.98mph. Second: 1 Willett 15:30.10 – 67.50mph, 2 Hughes, 3 Goldsmith. FL: Willett 1:52.27 – 69.90mph. First sound of thunder: 1 Simpson 14:34.59 – 71.79mph, 2 Noble, 3 D Plane (Apr). FL: Simpson 1:47.34 – 73.11mph. Second: 1 Simpson 14:18.36 – 73.14mph, 2 L Reveley (Duc), 3 Noble. FL: Simpson 1:45.45 – 74.42mph. First pro bike open (5 laps): 1 Fisher 9:05.29 – 71.96mph, 2 S Jarvis (Yam), 3 R Barnes (Kaw). FL: Fisher 1:47.90 – 72.73mph. Second: 1 Shaw 14:12.70 – 73.63mph, 2 Fisher, 3 M Hemsworth (Suz). FL: Shaw 1:44.72 – 74.94mph. Irish racer Ryan Farqhuar dominated the unlimited and 600 races at dull and dismal, more importantly, dry, Oliver’s Mount on Sunday winning four of the Auto 66 races at the Scarborough circuit. His winning margin in the second leg of the Spring Cup was over ten seconds, ahead of Mick Goodings. Farqhuar also got his Harker Kawasaki round the track at 79.59mph in the same race. Chris Palmer also ran off with the 125 and 250 races riding on his Mannin Hondas. Doncaster club racer Mick Goodings had one of his best ever outing at his home track chalking up two wins and three second places riding his Yamaha R6. Bradford postal worker Conrad Harrison with passenger Lee Patterson did the Oliver’s Mount double continuing his Croft Circuit double win seven days prior to Sunday’s meeting. First 125 (6 laps): 1 C Palmer 12:54.88, 2 W Dunlop, 3 A Neill (all Hon). FL: Palmer 2:01.83 – 67.73mph. Second: 1 Palmer 12:47.36, 2 W Hamilton, 3 D Mathison (all Hon). FL: Palmer 2:01.22 – 68.40 mph. First 250 (3 laps): 1 Palmer 6:05.86 – 71.73mph, 2 P Harvey (Hon), 3 I Lintin (Yam). FL: Palmer 1:57.25 – 74.60mph. Second: 1 Palmer 16:04.62 – 72.55mph, 22 G Dickinson (Hon), 3 D Gurney (Hon). FL: Palmer 1:57.62 – 74.36mph. First 400 (6 laps): 1 M Goodings (Kaw) 12:12.87 – 71.61mph, 2 A Haworth (Yam), 3 D Woolams (Hon). FL: Goodings 1:59.37 – 73.28mph. Second: 1 Goodings 11:58.47 – 73.05mph, 2 A Haworth, 3 D Woolams. FL: Goodingss 1:58.28 – 73.95mph. Spring Cup (Heat one 4 laps): 1 M Goodings (Yam) 7:46.01 75.08mph, 2 D Agnew (Suz), 3 W Dunlop (Yam). FL: Goodings 1:54.75 – 76.23mph. Heat two 4 laps: 1 R Farqhuar (Kaw) 7:34.82 – 76.58mph, 2 R Gibson (Yam), 3 N Vicars (Hon). FL: Farqhuar 1:51.57 – 74.43mph. First leg Spring Cup: 1 Farqhuar 14:54.88 – 78.20 mph, 2 Goodings, 3 Agnew. FL: Farqhuar 1:50.54 – 79.13mph. Second: 1 Farqhuar 14:50.73 – 78.56mph, 2 Goodings (Yam), 3 K Pringle (Suz). FL: Farqhuar 1:49.91 – 79.58mph. First leg F600 (8 laps): 1 Farqhuar 15:18.33 – 76.87mph, 2 Goodings, 3 Dunlop. FL: Farqhuar 1:51.36 – 76.87mph. Second: 1 Farqhuar 15:10.97 – 76.82mph, 2 Goodings, 3 R Mountford (Yam). FL: Farqhar 1:51.47 – 78.4 mph. First Mini Twins (3 laps): 1 D Bell (Kaw) 6.30.57, 2 M Minns (Kaw), 3 T Turtle (Suz). FL: Bell 2:00.85 – 67.19mph. Second: 1 Bell 16:13.14, 2 Minns, 3 Turtle. FL: Bell 1:59.18 – 71.91mph. First B Final (6 laps): 1 I Lintin (Suz) 10:21.00 – 84.52mph, 2 S McIvenna (Yam), 3 R Johnson (Hon). FL: Lintin 2:03.47 – 70.85mph. Second: 1 V Gilmore (Yam) 11:51.76 – 73.74mph, 2 D Woolams (Tri), 3 Lintin. FL: Gilmore 1:54.44 – 76.44mph. First Sidecar (6 laps): 1 C Harrison/L Patterson (Hon) 12:25.01 – 70.45mph, 2 T Thirkell/L Barlow (Hon), 3 I Neary/J Winn (Suz). FL: Neary 2:01.86 – 71.78mph. Second: 1 Harrison 12:09.48 – 71.95mph, 2 Neary, 3 G Lambert/A Winn (Hon). FL: Harrison 2:00.20 – 72.77mph. Championship points: 1 Reed 318pts, 2 Windham 305, 3 Millsaps 244. Championship points: 1 Canard 147pts, 2 Villopoto 137, 3 Izzi 99. Championship: 1 Michael Brown (Beta) 49, 2 Graham Jarvis (Sherco) 57, 3 Shaun Morris (Gas) 74 4 Alexz Wigg (Mon) 88. 5 Sam Haslam (Gas) 101, 6 Ross Danby (Gas) 120. Championship points: 1 Brown 40, 2 Jarvis 30, 3 Morris 30, 4 Wigg 23, 5 Haslam 22, 6 Danby 18.